Family villa holidays are becoming more and more popular and it is easy to see why. The flexibility of self catering, the security of your secluded surroundings and your own private pool make this family villa the ideal choice. We want your holiday to be as stress free and relaxing as possible for you and as exciting and fun as possible for the kids! With this in mind the Icandi Hideaway villa comes fully equipped with cot, highchair, car seat, walker, playpen, toys and books. Hours of fun can be had in the pool, with a shallow ledge area, that is perfect for smaller children to splash about in. There are also inflatables available for babies and toddlers. 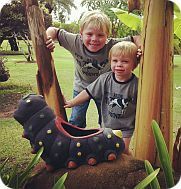 For a break from the pool, children can safely explore the surrounding exotic gardens and enjoy the animal statue hunt. With this child friendly villa as your base to explore the many family activities, beautiful sights and safe beaches of Thailand, Icandi Hideaway offers the perfect family holiday.